tl;dr: Use location.hash (instead of location.href or the src attribute of iframes) to do fast synthetic navigations that trigger a UIWebViewDelegate's webView:shouldStartLoadWithRequest:navigationType: method. The workaround did allow us to communicate back to the native Objective-C code, but it seemed to be higher latency than I would expect, especially on lower-end devices like the iPhone 4 (where it was several milliseconds). I decided to poke around and see what happened between the synthetic URL navigation happening and the delegate method being invoked. Getting a stack from the native side didn't prove helpful, since the delegate method was invoked via NSInvocation with not much else on the stack beyond the event loop scaffolding. However, that did provide a hint that the delegate method was being invoked after some spins of the event loop, which perhaps explained the delays. location.href: Setting the location.href property to a synthetic URL. <a> click: Simulating clicking on an anchor node that has the synthetic URL set as its href attribute. location.hash: Setting the location.hash property to a the data encoded as a fragment. The reason why it's faster than replacing the whole URL is because same-page navigations are executed immediately instead of being scheduled (thanks to Will Kiefer for telling me about this). In practice this turns out to be even faster than <a> click since the latter fires a click event, which results in a hit target being computed, which forces layout. frame.src: Setting the src property of a newly-created iframe. Based on examining the chrome.js file inside the Chrome for iOS .ipa, this is the approach that it uses to communicate: it creates an iframe with a chromeInvoke://... src and appends it to the body (and immediately removes it). This approach does also trigger the navigation synchronously, but since it modifies the DOM the layout is invalidated, so repeated invocations end up being slower. XHR sync/async: XMLHttpRequests that load a synthetic URL, either synchronously or asynchronously; on the native side, the load is intercepted via a NSURLProtocol subclass. This is the approach that Apache Cordova/PhoneGap prefers: it sends an XMLHttpRequest that is intercepted via CDVURLProtocol.This also ends up being slower because the NSURLProtocol methods are invoked on a separate thread and it has to jump back to the main thread to invoke the endpoint methods. My tests show the location.hash and synthetic click approaches consistently beating location.href (and all other mechanisms), and on low-end devices they're more than twice as fast. One might think that a few milliseconds would not matter, but when responding to user input and doing several such calls, the savings can add up⁴. For synthetic clicks, changing the href attribute of the anchor node would normally invalidate the layout of the page. However, you can avoid this by not adding the node to the document when creating it. Additionally, not having the anchor node in the document also avoids triggering any global click event handlers that you have have registered. There are also more exotic approaches possible, for example LinkedIn experimented with WebSockets and is (was?) using a local HTTP server. Somewhat coincidentally, NavigationScheduler is where I made one of my first WebKit contributions. Though back then it was known as RedirectScheduler. In addition to implementing a WebFrameLoadDelegate method, another way of getting at a JSContext is via KVO to look up a private property. The latter is in some ways more direct and straightforward, but it seems even more likely to run afoul of App Store review guidelines. Though I've mentioned it off-hand a couple of times, I haven't explicitly blogged that I left Google towards the end of 2012¹. I joined Quip, a small start-up in San Francisco that's trying to re-think word processing. My ​mid-2010 switch to the Chrome team was prompted by a desire to understand “the stack” better, and also a slight fear of being typecast as a frontend guy and thus narrowing my options of projects. However, after several months of working on the rendering engine, I realized that I missed the “we've shipped” feeling created by being on a smaller, focused project with distinct milestones (as opposed to continuously improving the web platform, though I certainly appreciate that as a platform client). I thus switched to the Chrome Apps team, co-leading the effort to build the “packaged apps” platform. We shipped the developer preview at Google I/O 2012, and I'm happy to see that these apps are now available to everyone. As we were building the platform, I got more and more jealous of the people building apps on top of it. Making samples scratched that itch a bit, but there's still a big gap between a toy app that's a proof of concept and something that helps people get their job done. I also found it hard to cope with the longer timelines that are involved in platform building — it takes a while to get developers to try APIs, making changes requires preserving backwards compatibility or having a migration strategy, etc. In the end, I realized that although I enjoy understanding how the platform works, I don't feel the need to build it myself. When Bret approached me about Quip in the fall of 2012, a lot of the above clicked together for the first time. It was also very appealing to get to work (with a small yet very capable team) on something that I would be using every day². My time working on Chrome also turned out to be well spent. Even on my first day I had to dig through the source to understand some puzzling behavior⁴. It's also been interesting to see how quickly my perspective on certain platform (anti-)patterns has changed. When I was working on Chrome, slow-running unload event handlers and (worse yet) synchronous XMLHttpRequests were obviously abominations that prevented a fluid user experience. Now that I work on a product that involves user data, those are the exact mechanisms that I need to use to make sure it's not lost⁵. I also view browser bugs differently now. Before I took them as an immutable fact of life, just something to be worked around. Now I still do the workaround, but I also report them. This is the biggest change (and improvement) between the last time I did serious web development (early 2010) and now — more and more browsers are evergreen, so I can rely on bug fixes actually reaching users. This doesn't mean that all bugs get fixed immediately; some are dealt with more promptly than others (and don't get me started on contentEditable bugs). The same benefit applies not just to bugs but also to features. I've been wishing for better exception reporting via the global onerror handler, and now that it's finally happening, we get to use it pretty quickly. It's not just Chrome or WebKit — when we started to look into Firefox support it didn't render Mac OS X Lion-style scrollbars, but shortly after our launch that shipped in Firefox 23, and we didn't have to implement any crazy hacks⁶. I hope to write more about the technical puzzlers that I've run into, since that's another way in which this experience has been very different from Google. At a big company there are mailing lists with hundreds of engineers that can answer your questions. Now that blogs (and Stack Overflow) fulfill the same need, I'd like to return the favor. This post a bit narcissistic. The primary audience is myself, 20 years from now. I'm guessing that Quip has more design docs written than the average year-old startup, since creating them is a chance to do more dogfooding. And on some days, I fix the espresso machine. If your HTTP response has a Last-Modified header and no other caching directives, Chrome will cache it for 10% of the time delta between the current time and the last modified time. Quip auto-saves frequently, but there's still a small window between when a change is made and when a tab could be closed during which data could be lost. Not knocking the hacks, we have our own share of crazy code, but the less code that we ship to the users, the better. An Accidental Tech Podcast episode from a few months ago had some reminiscing of the ways to get online in the mid-90s (most notably, the X2 vs. K56flex debate). I thought I would write down some of my earliest recollections of Internet access¹. The first (indirect) Internet access that I recall having was in the spring of 1995². My dad had access to an FTP-to-email gateway³ at work, and had discovered an archive that had various space pictures and renderings. He would print out directory listings and bring them home. We would go over them, and highlight the ones that seemed interesting. The next day he would send the fetch requests, the files would be emailed to him, and he would bring them home on a floppy disk. In this way I acquired an early International Space Station rendering and a painting of Galileo over Io. I recall using the latter picture as my startup screen, back in the day when having so many extensions that they wrapped onto a second row was a point of pride, and the associated multi-minute startup time necessitated something pretty to look at. A little while later, my dad found an archive with Mac software (most likely Info-Mac or WUArchive). This was very exciting, but all of the files had .sit.hqx extensions, which we hadn't encountered before (uuencoding was the primary encoding that was used in the email gateway). .hqx to turned out to refer to BinHex, which Compact Pro (the sole compression utility that I had access to⁴) could understand. A bit more digging turned up that .sit referred to StuffIt archives, and the recently released (and free) StuffIt Expander could expand them. We somehow managed to find a copy of StuffIt that was either self-expanding or compressed in a format CompactPro understood, and from that point I was set. In the early summer of 1995, almost at the end of the school year, my school got Internet access through the 100 Schools project⁵. It would take until the fall for the lab to be fully set up, but as I recall there was a server/gateway (something in the NEC PC-98 family running PC-UX) connected to 3 or 4 LC 575s (see the last picture on this page). Also at the end of the school year a student who had graduated the year before came by, and told wondrous tales of high-speed in-dorm Internet access. At this point I still didn't have Internet access at home, but I did have a copy of the recently released version 1.1 of Netscape. I learned a bunch of HTML from the browser's about page​⁶, since it was the only page that I had local access to. A little while later, we finally got proper Internet access at home. I had read Neuromancer over the summer, and it left a strong impression. Before dialing up to the ISP I would declare that I was going to “jack in” and demand that the lights be left off and that I not be disturbed, all for a more immersive experience. In the spring of 1996 we upgraded to a Global Village⁷ Teleport Platinum, going from 9600 baud to 28.8Kbps⁸. Over the summer, the modem developed an annoying tendency to drop the connection without any warning, with no obvious trigger. It eventually became apparent that this was correlated with the air conditioning kicking in. The modem was a U.S. model, designed for 120V. Japan runs at 100V, and though most U.S. electronics worked at the lower voltage, the extra load caused by the air conditioning (on the same circuit) turning on was enough to briefly reset the modem. The problem was solved by a (surprisingly large) 100V-to-120V step up transformer. Over the next couple of years there was my first domain name, an upgrade to ISDN (a blazing fast 128Kbps when going dual-channel! ), a Hotline phase, etc. However, this part is less interesting, both because it became increasingly common to have Internet access, and thus the stories are more alike, and because it's better documented. I don't expect the contents of this post to have been all that interesting to anyone else. It was still an interesting exercise, both in terms how much I could remember and how much I could reconstruct given my personal archive and what's on the Internet. Given the advantages of digital storage that I had, I'm that much more impressed that memoirs manage to achieve any reasonable level of accuracy. Also as a way of testing Quip's new link inspector/editor. To give a bit of context, I was in middle school and living in Japan at the time. The Japan bit is relevant given its lag in Internet adoption. Some people use the web in this fashion even today. Despite using it for years, I dutifully clicked “Not Yet” in the shareware startup nag screen every time. Sorry Bill Goodman! Based on this list of domain names the smis.setagaya.tokyo.jp domain name was activated on May 26, 1995. As I recall, it was more than just a wall of text, it used both the <center> tag and tables. For reasons that I still don't understand, Global Village initially had the domain name globalvillag.com. Having gotten all my data out of Google Reader, the next step was to do something with it. I wrote a simple tool to dump data given an item ID, which let me do spot checks that the archived data was complete. A more complete browsing UI was needed, but this proved to be slow going. It's not a hard task per se, but the idea of re-implementing something that I worked on for 5 years didn't seem that appealing. zombie_reader is the implementation of that idea. It's available as another tool in my readerisdead.com collection. Once pointed at a directory with an archive generated by reader_archive, it parses it and starts an HTTP server on port 8074. Beyond serving the static resources that were saved from Reader, the server uses web.py to implement a minimal (read-only) subset of Reader's API. A side effect is that I now have a self-contained Reader installation that I'll be able to refer to years from now, when my son asks me how I spent my mid-20s. It also satisfies my own nostalgia kicks, like knowing what my first read item was. In theory I could also use this approach to build a proxy that exposes Reader's API backed by (say) NewsBlur's, and thus keep using the Reader UI to read current feeds. Beyond the technical issues (e.g. impedance mismatches, since NewsBlur doesn't store read or starred state as tags, or has per item tags in general) that seems like an overly backwards-facing option. NewsBlur has its own distinguishing features (e.g. training and "focus" mode)2, and forcing it into a semi-functional Reader UI would result in something that is worse than either product. And changing the logo to make it more obvious that this isn't just a stale tab from last week. The font is called Demon Sker. One of the reasons why I picked NewsBlur is that it has been around long enough to develop its own personality and divergent feature set. I'll be the first to admit that Reader had its faults, and it's nice to see a product that tries to remedy them. Update on July 3: The reader_archive and feed_archive scripts are no longer operational, since Reader (and its API) has been shut down. Thanks to everyone that tried the script and gave feedback. For more discussion, see also Hacker News. There remain only a few days until Google Reader shuts down. Besides the emotions1 and the practicalities of finding a replacement2, I've also been pondering the data loss aspects. As a bit of a digital pack rat, the idea of not being able to get at a large chunk of the information that I've consumed over the past seven and a half years seems very scary. Technically most of it is public data, and just a web search away. However, the items that I've read, tagged, starred, etc. represent a curated subset of that, and I don't see an easy of recovering those bits. Reader has Takeout support, but it's incomplete. I've therefore built the reader_archive tool that dumps everything related to your account in Reader via the "API". This means every read item3, every tagged item, every comment, every like, every bundle, etc. There's also a companion site at readerisdead.com that explains how to use the tool, provides pointers to the archive format and collects related tools4. I don't fault Google for providing only partial data via Takeout. Exporting all 612,599 read items in my account (and a few hundred thousand more from subscriptions, recommendations, etc.) results in almost 4 GB of data. Even if I'm in the 99th percentile for Reader users (I've got the badge to prove it), providing hundreds of megabytes of data per user would not be feasible. I'm actually happy that Takeout support happened at all, since my understanding is that it was all during 20% time. It's certainly better than other outcomes. Of course, I've had 3 months to work on this tool, but per Parkinson's law, it's been a bit of a scramble over the past few days to get it all together. I'm now reasonably confident that the tool is getting everything it can. The biggest missing piece is a way to browse the extracted data. I've started on reader_browser, which exposes a web UI for an archive directory. I'm also hoping to write some more selective exporters (e.g. from tagged items to Evernote for Ann's tagged recipes). Help is appreciated. I am of course saddened to see something that I spent 5 years working on get shut down. And yet, I'm excited to see renewed interest and activity in a field that had been thought fallow. Hopefully not having a a disinterested incumbent will be for the best. Still a toss-up between NewsBlur and Digg Reader. Up to a limit of 300,000, imposed by Reader's backend. If these command-line tools are too unfriendly, CloudPull is a nice-looking app that backs up subscriptions, tags and starred items. Google's Feed API will continue to exist, and it's served by the same backend that served Google Reader. However it does not expose items beyond recent ones in the feed. It occurred to me that I never blogged about my Source Quicklinks extension (source). I created it back in 2010, when I started working on the Chrome team, focusing on the WebKit side of things. I was spending a lot of time in Code Search trying to understand how things worked. 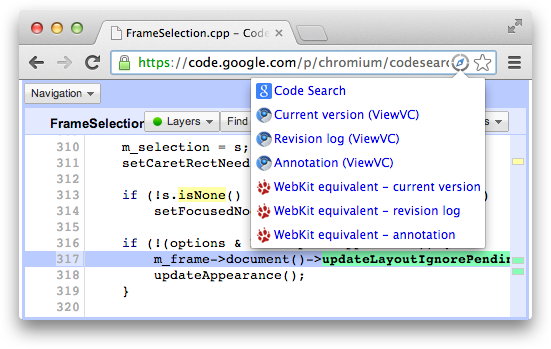 Chromium's code search instance searches not just the Chromium repository itself, but also all its dependencies (WebKit, V8, Skia, etc.). A lot of times the only way to understand a piece of code was to look at the commit that added it (especially in WebKit code, where comments are scarce but the bug associated with the commit often provides the back story). I was therefore doing a lot of URL mangling to go from Code Search results to Trac pages that had "blame" (annotation) views. The extension made this process easier, adding a page action that provides back and forth links between Code Search, the Chromium repository (both the ViewVC and the Gitweb sites), WebKit's Trac setup and V8. Later, when the omnibox API became available, it also gained a "sql" search shortcut for the Chromium repository and commits. Though I no longer work on Chrome, I still find myself going through those code bases quite often. For example, the best way to know whether something triggers layout in Blink/WebKit is by reading the code. I've therefore revved the extension to handle the Blink fork, in addition to cleaning up some other things that had started to bitrot. I also attempted to add cross-links between the WebKit and Blink repositories that takes into account the Blink reorganization, though we'll see how useful that ends up being as the codebases diverge more and more. I started to think about creating a purpose-built REPL for Chrome apps APIs. A generic REPL seemed out of the question, due to eval being disallowed due to the strict Content Security Policy used by apps. My initial thought involved a dropdown listing all functions in the chrome. * namespace and a way to invoke them with canned values (eval may be disallowed, but dynamic invocation of the form chrome[namespace][methodName](arg) is still possible). However, that seemed clunky, and wouldn't help with APIs like the socket one that need to chain several method calls with the parameters for one depending on the results of another. This plan hinged on fact that nearly all Chrome apps APIs are asynchronous already, thus it should be possible to create seemingly functionally identical proxies in the sandboxed frame. That way, as far as the user is concerned, they're running the original API methods directly. There would need to be some additional bookkeeping to make callback parameters work, but there was no technical barrier anymore. The main frame (also referred to as the "host" in the source code) gets the input and sends it to the sandboxed frame via a EVAL message. The sandbox dutifully evals it. chrome.socket.create is a stub that was created in the sandboxed frame: at application startup, the main frame walks over the chrome. * namespace and gathers all properties into a map and sends them to the sandbox (via a INIT_APIS message). The sandbox re-creates them, and for function properties and events a stub is generated. When the stub is invoked, it sends a RUN_API_FUNCTION message to the main frame with the API method (chrome.socket.create in this case) that should be run and its parameters. Most parameters can be copied directly via the structured clone algorithm that is used by postMessage. However, the second parameter is function that cannot be copied. Instead we generate an ID for it, put it in a pending callbacks map, and send the ID in its place. On the main frame side, the list of parameters is reconstructed. For function parameters, we generate a stub based on the ID that was passed in. Once we have the parameters, we invoke the API function (via dynamic invocation, see above) with them. When the stub function that was used as the callback parameter is invoked, it takes its arguments (if any), serializes them and then sends them and its function ID back to the sandboxed frame via a RUN_API_FUNCTION_CALLBACK message. The sandboxed frame looks up the function ID in the callbacks map, deserializes the parameters, and then invokes the function with them. The callback function uses the log() built-in function. That ends up sending a LOG message to the main frame with the data that it wants logged to the console. Events work in a similar manner, with stubs being generated for add/removeListener() in the sandbox that end up adding/removing listeners in the main frame. There are two maps of listener functions, one in the sandboxed frame from ID to real listener, and one in the main frame from ID to stub/forwarding listener. This allows removing of listeners to work as expected. In addition to being a useful developer and leaning tool, I hope that this REPL also helps with thinking with a sandboxed mindset. I know that the Content Security Policy that's used in apps has been controversial, with some taking it better than others. However, I think that privilege separation, declarative permissions, tying capabilities to user gestures/intent and other security features of the Chrome apps runtime are here to stay. CSP is applicable to the web in general, not just apps. Windows 8 requires sandboxing for store apps and its web-based apps are taking an approach similar to CSP to deter XSS. Sandboxing was one of the main themes for Mac desktop developers this year, with Apple finally pulling the trigger on sandbox requirements. Developers of large, complex applications were able to adapt them to the Mac OS X sandbox. That gives me hope that the Chrome app sandbox will not prevent real apps from being created. It's is starting with the even more restrictive web platform sandbox and relaxing it slightly, but is generally aiming for the same spot as the Mac one. I'm also hopeful that there will be improvements that make it even easier to write secure apps. For example, the privilege isolation provided by sandboxed pages was inspired by a USENIX presentation (the paper presupposed no browser modifications, the Chrome team just paved the cowpath). pkg.js is a library that's cropped up recently for making such main/sandboxed frame communication easier. Note that this not the desired pattern for communication between the main and sandboxed frames. Ideally messages that are passed between the two should be as high-level as possible, with application semantics, not low-level Chrome API semantics. For example, if your sandboxed frame does image processing, it shouldn't get to pick the image paths that it reads/writes from; instead it should be given (and return) a blob of image data; it's up to the main frame to decide where it gets that image data (by reading a path on disk, from the webcam, etc.). Otherwise if the code in the sandbox is malicious, it could abuse the file I/O capability.